Harmful algal blooms are becoming all too common in our waters. 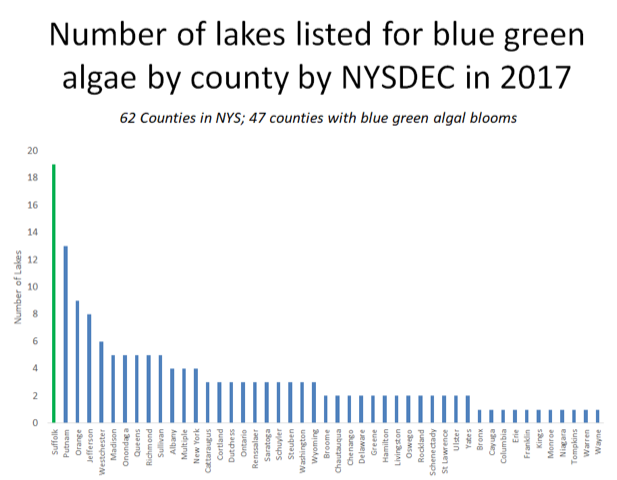 Just this weekend, NYS Department of Environmental Conservation (DEC) announced four new waterbodies to their Harmful Algal Blooms Notification Page, bringing the State-wide total to 18. Five of these are located in Suffolk County, which has the highest number of sites than any other affected county. But what is a harmful algal bloom? Also known as HABs, these occur when colonies of saltwater and freshwater algae grow out of control while producing toxic and harmful effects on people, pets, fish, shellfish, marine mammals, and birds. Learn more about this on National Oceanic and Atmospheric Administration (NOAA) National Ocean Service page here. Not all algal blooms are the same. Marine algal blooms such as red tide and brown tides have plagued Long Island waters, leading to shellfish bed and beach closures, and they are getting worse. In many cases, HABs can make shellfish unsafe to eat and pose a threat to Long Island’s valuable shellfish industry. HABs can also threaten our region’s vast recreational opportunities associated with our Long Island way of life. In fact, Northport Harbor and Huntington Harbor are currently closed to the harvest of some types of shellfish by the DEC due to the presence of HABs. These particular blooms are also the type that make it dangerous for humans and pets to go swimming. Harmful algal blooms have been linked to nitrogen pollution, one of the biggest threats facing Long Island waters. You can stand up for clean water and the health of our bays, harbors, and creeks by joining the Long Island Clean Water Partnership today!